Master one of the most fundamental aspects of blues guitar in this lesson. 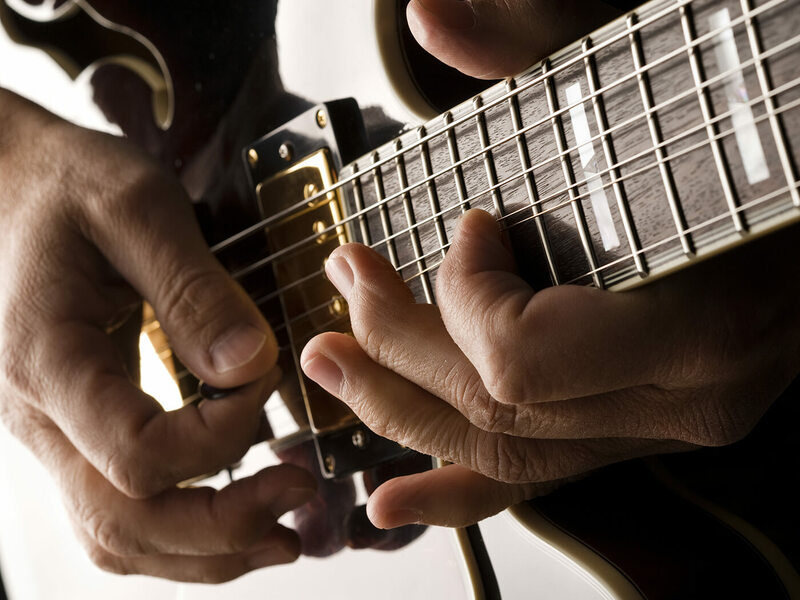 It’s time to talk about one of the most common elements of blues playing, string bending. You’ve seen it from BB King to Clapton to SRV to Gilmour. Every one of our blues heroes, at some point pushes those strings to the sky and makes them scream. Let’s get those fingertips torn (SRV supposedly used to repair his torn fingertips with superglue mid gig – the perils of bending on a Strat strung with 13s!). String bending takes practise and patience to master. The initial stages will be tough on your finger tips but as you progress, this will become easier. It’s best practice to bend with your third finger where possible and use your first and second fingers to support the bend. Supporting the bend with multiple fingers will spread the string tension out across multiple finger tips and allow you to control the motion more than if you were using just one finger. The other key aspect of string bending is pitching the bend correctly. Bending strings is often a very purposeful act where you will be aiming for another note within the scale. You can also target notes outside of your scale notes for more atonal or dissonant effects. For this lesson, we will be using both shape one and shape two of the minor pentatonic scale in the key of A minor. You’ll notice from looking at these notes that they are from a combination of both the pentatonic shapes on the G string. We will be using this three-note phrase to start our ear training. 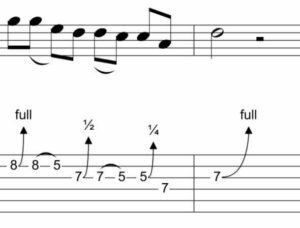 The aim is to get familiar with the pitch of the highest note, in this case, it’s the 9th fret of the G. The reason we want to become familiar with this note is that we are now going to bend the 7th fret up to the pitch of the 9th. When doing this, you want to play the higher note, then try to match it with your bend. Listen closely to the pitching and trust your ears. You should think carefully about your bent note; do you hear the same pitch at the fretted note? Does it sound too high or too low? Hearing these differences will allow you to make corrections. This type of bend is called a full tone (or full step) bend. It involves bending the note up the equivalent pitch of two frets. There are two other types of bends that you will use a lot in blues playing. Quarter tone (Or quarter step) bends are also used a lot in blues playing. Quarter step bends fall into a group of bends known as microtonal bends which are bends between the available notes. The guitar fretboard is laid out in semitone steps, so a quarter tone would indicate a pitch between two frets. This bend is typical of many blues players vocabulary and contributes to the very “vocal” sound many of the greats achieve with their playing. BB King was a big user of these bends to make his guitar seem like it was talking. A quarter tone bend does not have a target pitch that we can recognize by playing a fretted note. To perform a quarter tone bend you would bend the string in the same way, but you would not push it up as far as you would for a half tone bend. When working on quarter tone bends you can play a note four times and apply the alternate bending on the second and fourth repeat as with the previous exercises. With this smaller bend, you are looking for an audible rise in pitch but not to the extent of it going up a fret in pitch. Quarter tone bends are often found on the lower end of a scale shape and done with the first finger, but they can be applied anywhere. The first bend is the 8th fret on the B string which is a full tone bend that targets the 10th fret of the same string. 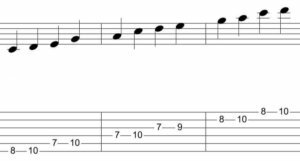 The 10th fret is a note in the second shape of the minor pentatonic scale, this links to the idea of targeting other notes in the scale. The next bend is a half tone bend from the 7th to the 8th fret of the G. The 8th fret of the G is not a note that is in the minor pentatonic scale, but it is an interval known as the♭V (flat fifth) which has the nickname of the “blues note”. If you add the♭V to the pentatonic scale it creates a bluesy overtone. This note will sit slightly outside of the key so will cause dissonance if lingered on for too long but a kind of dissonance that works with this playing style. You will also notice the quarter tone bend on the 5th fret of the G, this will add a little vocal influx towards the end of the descending phrase. The final bend is the 7th fret on the G up to the pitch of the 9th which is also in the second shape of the scale. By this point you may have already started to form some of your own patterns using the scales and techniques we have discussed. Back in lesson six we talked about the idea of combining some rhythmic phrases with some lead embellishments. This is the perfect technique to revisit with string bending added to your trick bag. Any of the phrases you might have used previously, you can substitute some of the notes for string bending. Target other notes in the scale shape or use the half and quarter tone bends to give your playing more of a vocal fluency. If you have enjoyed this lesson and you’re looking for a guitar teacher in your local area check out our guitar lessons page and speak to one of our highly recommended teachers in your local area. If you are based in the Birmingham area check out our Guitar Lessons Birmingham page. Leigh Fuge is a guitar teacher and professional musician from Swansea in the UK. He has taught hundreds of students face to face and via the MGR Music platform. He has over 10 years’ experience working in the industry as a touring musician, session guitarist and teacher.